Direct linear reading in 5 ranges, 100pF, 1nF, 10nF, 100nF, and 1uF full scale. ABS or stove enamelled diecast box. 12/13.5V operation at 10mA. Accuracy within +/-2%. With 13cm (5") probe wires and connectors. ABS box kit £50.50 UK, £56.50 EU tracked, £59.00 World. Ready built £71.50 UK, £79.75 EU, £82.50 World. Price include tracked carriage. 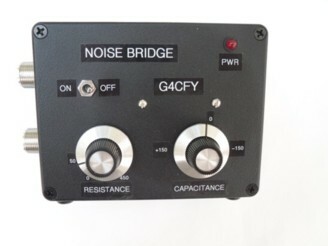 The G4CFY Noise Bridge is used to measure resistance and capacitance of aerials. also to allow transmitting Amateurs to perfectly match the ATU and aerial system without the need to use a tune transmission. Useable 1.8 to 70MHz. Noise source when switched on. Straight through when switched off. Runs for internal 9V PP£ battery. Box kit £58.00 UK, £67.50 EU, £71.50 World. Ready built £86.50 UK, £95.50 EU, £99.50 World, all including tracking. PEP METER MODULE. 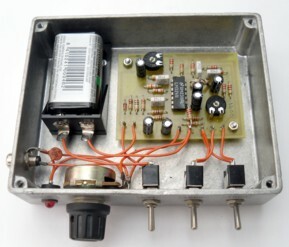 Add-on board for a power meter to enable peak power to be observed. Derived from a design by John Fielden GW4HAH published in Rad Com in January 1989. Design subsequently found to have a rising reading when idle. 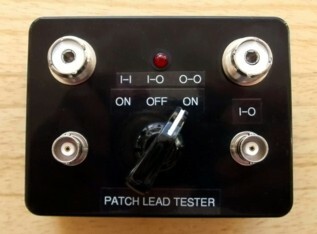 Post design component changes solved this and overcame the need for an offset adjust circuit. Board size 46x44x12mm high. PCB kit £13.25 UK, £15.25 EU, £16.25 World. PCB kit plus switches, connectors and fixings £17.00 UK, £19.00 EU, £20.00 World. 1.8-52MHz in four power ranges 1, 10, 100, and 200W with an accuracy of +/-5%. Thruline concept with a toroidal current transformer sampling element. Switched forward and reverse reading. SO239 connectors. Each unit is individually calibrated on each range. Ready Built and calibrated £74.00 UK, £83.50 EU, £87.50 World, including tracking. LCR BRIDGE with 5 resistance ranges, 100, 1K 10K 100K, & 1M. 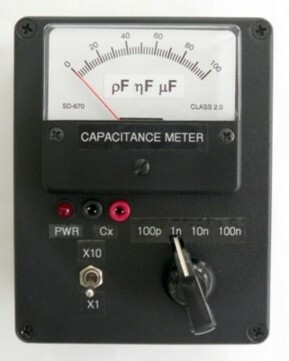 3 capacitance ranges, 100pF, 1nF, 10nF, and 3 inductance ranges 1mH, 10mH, & 100mH, plus an external reference. Scale calibrated 0.01 to 10 times reference value. Optional drilled and labelled plastic or diecast box. Full kit with plastic box £48.00 UK, £54.00 EU, £56.50 World. Full kit with diecast box £61.00 UK, £70.50 EU, £74.50 World. Ready built in plastic box £69.00 UK, £77.25 EU, £80.00 World. Ready built in diecast box £82.50 UK, £91.50 EU, £95.50 World. All include tracked carriage. OFF-AIR FREQUENCY STANDARD This is a calibration unit phase locked to Radio 4 on 198kHz using a twin PLL system. It includes a monitor receiver to ensure Radio 4 is being heard loud and clear. Fixed outputs are 10MHz at 2V p-p, and 1kHz at 1V p-p as an oscilloscope CAL signal. Switched outputs are 1MHz, 100kHz, 10kHz, and 1kHz at 6V p-p into 500 ohms. Single board design as featured in July & September 2008 PW. Background heterodyne whistle at 2kHz confirms lock condition. 12/13.5V DC operation at 65mA. PCB kit with ferrite rod aerial £61.00 UK, £67.25 EU. Complete box kit £106.50 UK, £112.00 EU. Ready Built £152.00 UK, £158.00 EU, all include tracked carriage. A vital test unit for power output, envelope, and carrier suppression testing of AM, DSB, and SSB transmitters. Either 1600Hz or 1800Hz tones or both. Diecast box size 102x84x40mm. PCB kit £12.50 UK, £14.25 EU, £15.25 World, tracking £5.50 extra. Box kit with all hardware £37.50 UK, £43.50 EU, £46.00 World, tracked. Ready built £59.50 UK, £67.75 EU, £70.50 World, including tracked carriage.